We came home from an outing on Saturday to find a basketball hoop in our driveway! 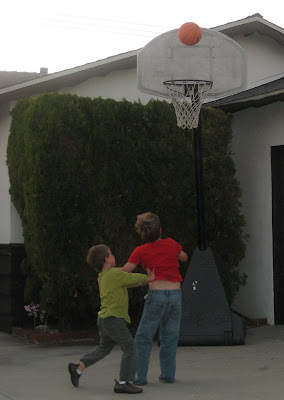 Michael lowered the hoop about 18 inches so that Ben could actually make a basket every now and then. We picked up a youth sized basketball (we only have a couple of soccer balls) and now they can't get enough! I keep hearing, "Mom, the ball went across the street again," so I've been teaching them that while one shoots, the other has to "guard" the street. Neither Michael nor I are sports fans or players, so our poor boys won't be getting any pointers from us, but they seem to be doing just fine! It turns out some nice folks down the street recently sent their youngest off to college and wanted the hoop out. They asked their neighbor for a recommendation of what to do with it, and they mentioned that we have two boys. Together they rolled it down the street. What a nice surprise, sure to bring hours of fun and exercise for the whole family!